Remarkably gracious and pleasantly sublime, this haven beckons those who seek relaxation in the midst of Baja's most exciting destination. A perfect setting for an elegant romantic rendezvous, this all-suite resort includes kitchenettes, satellite TV, deluxe amenities and features a full range of services, including a European-style spa and fine dining. 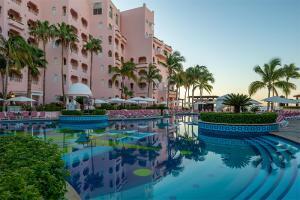 Located on the best beach in Cabo and walking distance to marinas, nightlife and shopping. In Cabo San Lucas at the tip of the Baja Peninsula nestled on the only swimming beach in Cabo San Lucas Bay. Mare Nostrum- Mexican, French, and Californian Cuisine, Fellini's Restaurant (the award-winning Fellini's, one of Mexico's finest restaurants), Pool Bar, and In Room Dining. Land's End, El Medano Beach, El Arco, Golf, Sport Fishing, Horseback Riding.